You don’t want to get caught vandalizing graffiti in Utah, especially if it happens to be by British street artist Banksy. Park City officials charged David William Noll with criminal mischief, a second degree felony, for vandalizing two murals by the famous street artist. Noll faces a fine of up to $10,000 and up to 15 years in prison for his transgression. Ouch. 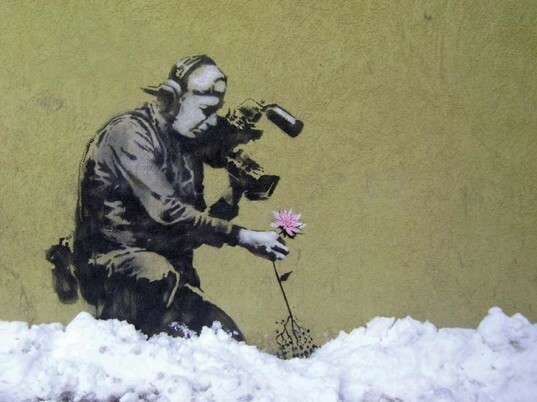 The murals appeared on Park City’s main street in 2010, after Banksy attended the Sundance Festival on behalf of “Exit Through the Gift Shop,” the “mockumentary” he starred in and helped produce. Local property owners, recognizing the value of a Banksy work, paid to protect the murals with glass, as others have done in cities around the world. According to prosecutors, Noll shattered the glass protecting the Banksy murals in Park City on New Year’s Eve, and then further damaged one of the works, an image of a boy praying on his knees, with dark brown paint. He said that he destroyed the work because he only supports “commissioned” graffiti. Noll faces a fine of up to $10,000 and up to 15 years in prison; according to Matthew Bates, the lead prosecutor, a plea deal is being negotiated, with a hearing scheduled for September 15, 2014. Police say they have video of Noll at the scene of the alleged crime. The first photo is in Bedford-Stuyvesant (Brooklyn), not Utah. I know it. I've seen it. You don't want to get caught vandalizing graffiti in Utah, especially if it happens to be by British street artist Banksy. Park City officials charged David William Noll with criminal mischief, a second degree felony, for vandalizing two murals by the famous street artist. Noll faces a fine of up to $10,000 and up to 15 years in prison for his transgression. Ouch.